You have added Floral Embroidered Anarkali Suit in Beige Brown Net to your Shopping Bag! This designer anarkali is definitely the top pick for the season. This beige brown embroidered net anarkali suit features all over zari and thread floral embroidered patterns embellished with stones and sequins work. Intricate zari embroidery with stones and beads work along the sheer round neckline and arms is complemented with sweetheart bodice. (If sweetheart neckline is not required, it can be fully covered with lining while stitiching ) The anarkali suit also features broad mehendi green zari and thread embroidered bordered hem. 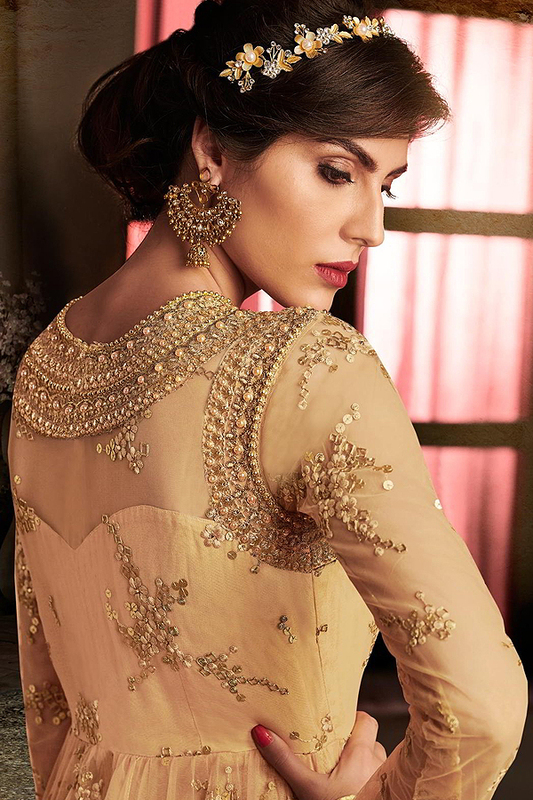 Matching chiffon dupatta with golden lace border completes the look. It comes with unstitched matching shantoon bottom. Opt for vintage style hair updo and adorn with floral hair accessory.